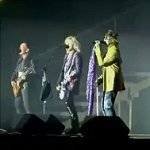 Def Leppard played the first show of the summer 2013 tour last night at the Hellfest Open Air Festival in Clisson France with 21 songs played. The first show of the summer tour saw the band play a 7 song opening set as "Ded Flatbird". The expected start of the 'Hysteria' album (as mentioned by Vivian recently) did not happen. 'Good Morning Freedom' and 'Wasted' were among the rarely played songs added into the first set alongside more traditional material. More importantly Vivian was in fine form and played the full show as normal in spite of having chemo treatment just two days before and the long flight to Paris. As you can see from the photos quite a lot of his hair has grown back (so not quite Joe Satriani after all, but still playing many notes!). The next show takes place tomorrow night in San Sebastian, Spain. Live Blog?.